Oh, why bother with this BEFORE Christmas? It’s more salient now, looking at the new year, and wondering what is the fate of man and men, in the new year. 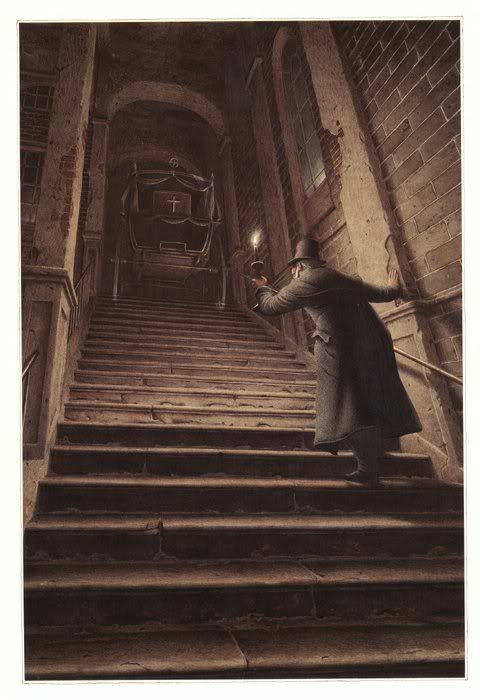 Ebenezer Scrooge, up a dark staircase; “Darkness was cheap, and Scrooge liked it.” Illustration by Roberto Innocenti, via Pinterest. Isn’t that the entire GOP platform in three words? “Darkness is cheap.” Substitute “Trump” for “Scrooge,” you’ve got the picture. I think of that line of Dickens’s often when I read of the celebrations of calumny that pass as discourse in Republican politics these days. Although, with the 2008 renewing of Limbaugh’s contract, it may no longer be true that his particular brand of darkness is cheap. With the advent of Donald Trump’s insult politics, offending America’s allies and all American ethnic groups possible, with un-ironic calls to drop nuclear weapons, GOP politics is even darker than ever. Cheap or not, darkness remains dark. Here is the sentence Dickens put before the quote, to add a little context; Scrooge was climbing a very large, very dark staircase. Half-a-dozen gas-lamps out of the street wouldn’t have lighted the entry too well, so you may suppose that it was pretty dark with Scrooge’s dip. Up Scrooge went, not caring a button for that. Darkness is cheap, and Scrooge liked it. From the foldings of its robe, it brought two children; wretched, abject, frightful, hideous, miserable. They knelt down at its feet, and clung upon the outside of its garment. ‘Oh, Man! look here. Look, look, down here!’ exclaimed the Ghost. They were a boy and girl. Yellow, meagre, ragged, scowling, wolfish; but prostrate, too, in their humility. Where graceful youth should have filled their features out, and touched them with its freshest tints, a stale and shrivelled hand, like that of age, had pinched, and twisted them, and pulled them into shreds. Where angels might have sat enthroned, devils lurked, and glared out menacing. No change, no degradation, no perversion of humanity, in any grade, through all the mysteries of wonderful creation, has monsters half so horrible and dread. Scrooge started back, appalled. Having them shown to him in this way, he tried to say they were fine children, but the words choked themselves, rather than be parties to a lie of such enormous magnitude. ‘Spirit! are they yours?’ Scrooge could say no more. ‘Have they no refuge or resource?’ cried Scrooge. ‘Are there no prisons?’ said the Spirit, turning on him for the last time with his own words. ‘Are there no workhouses?’ The bell struck twelve. Scrooge looked about him for the Ghost, and saw it not. As the last stroke ceased to vibrate, he remembered the prediction of old Jacob Marley, and lifting up his eyes, beheld a solemn Phantom, draped and hooded, coming, like a mist along the ground, towards him. Think of 2014, 2015, and 2016, children abused in Central America and in the Middle East, fleeing as best they can, only to die, off the shores of Greece, on the southern deserts of the U.S., or be cast into incarceration after having achieved a nation whose very name promised them refuge, the United States. “Two children; wretched, abject, frightful, hideous, miserable,” Dickens described. Whose children? “Man’s.” Yours, and mine. Christmas is a festival to celebrate light, what many Christians call “the light of the world?” If so, let us work to stamp out the darkness which the unrepentant Scrooge so dearly loved. Darkness may be cheap, but it is not good. Light a candle, and run into the darkness, spreading light. We need more light. Hope you had a merry Christmas in 2016. Let us remember, as Tom and the late Ray Magliozzi always reminded us, the cheapskate pays more in the end, and usually along the way. Is Darkness cheap? Let us then eschew it as too costly for a moral nation, too costly for a moral people. Is Donald Trump as smart as Ebenezer Scrooge? Is his heart as good as Scrooge’s heart? Yes, this is an encore post, mostly. Fighting ignorance is taking a lot longer than anyone thought. Think of 2014 and 2015, children abused in Central America and in the Middle East, fleeing as best they can, only to die off the shores of Greece, on the southern deserts of the U.S., or be cast into incarceration after having achieved a nation whose very name promised them refuge, the United States. “Two children; wretched, abject, frightful, hideous, miserable,” Dickens described. Whose children? “Man’s.” Yours, and mine. Merry Christmas 2015. Let us remember, as Tom and the late Ray Magliozzi always reminded us, the cheapskate pays more in the end, and usually along the way. Is Darkness cheap? Let us then eschew it as too costly for a moral nation, too costly for a moral people. I think of that line of Dickens’s often when I read of the celebrations of calumny that pass as discourse in Republican politics these days. Although, with the 2008 renewing of Limbaugh’s contract, it may no longer be true that his particular brand of darkness is cheap. 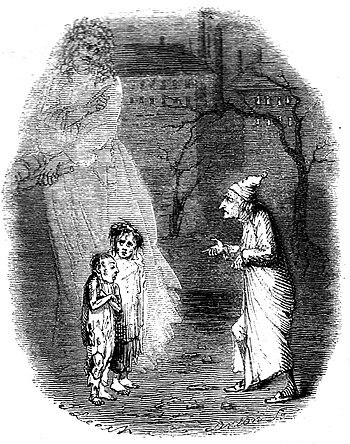 Drawing by John Leech (1809-1870), to illustrate Charles Dickens’ A Christmas Carol. Work in the public domain (available at WikiSource). I thought of that line of Dickens’s when, months ago, I read of this celebration of darkness, ignorance and calumny. Although, with the recent renewing of Limbaugh’s contract, it may no longer be true that his particular brand of darkness is cheap. This is mostly an encore post, unfortunately made more urgent recently. What is the driving motivation of Republican budget cuts in Texas, Wisconsin, and the rest of the nation? I thought of that line of Dickens’s when I read of this celebration of darkness, ignorance and calumny. Although, with the recent renewing of Limbaugh’s contract, it may no longer be true that his particular brand of darkness is cheap.